If you want to know what’s happening in Live Casino in 2017 then the ICE Totally Gaming conference was the place to be. It’s one of the biggest, if not the biggest International Casino Exhibition in the world. It descends on London each year and just gets bigger and bigger. Businesses engaged in gaming, both online and land based attend so they can showcase their products. Some use the conference to launch new products and you’ll see later that’s exactly what’s happened in the world of Live Casino. I spent two days at the conference talking to all the live casino suppliers that attended. It’s the most interesting two days I’ve had in ages and boy there is a lot going on. 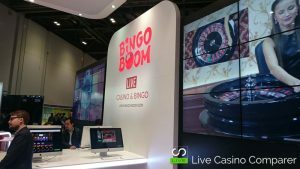 The focus and prominence of Live Casino in 2017 have never been stronger and it’s taken a big step forward since last year’s event. Evolution Gaming and Playtech had very large stands with plenty of new initiatives and products to talk about. Niche provider Authentic Gaming had a relatively big stand and they are doing some good things. But what really surprised me was the presence of the top Asian Live Casino suppliers. It was great chatting with them, seeing their products and understanding why they were attending the show. Click here if you’d like to read more. 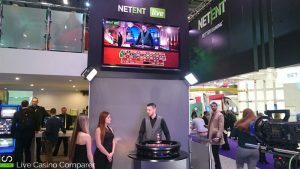 NetEnt provided me with some light relief where they taught me how to spin a roulette wheel and I got to chat with a couple of the dealers while it was streamed live in the venue. Good fun but a great example of how easy technology makes things happen. So here’s my rundown of Live Casino in 2017 as presented at ICE Totally Gaming. It’s not industry comprehensive as some suppliers were not at the conference, but it’s the next best thing and probably the only comprehensive roundup you’ll read. Authentic Gaming provides live streaming of roulette from land based casinos and resorts. Based in Malta they are building a very impressive client list with their niche products. Visitors to the conference could enrol in a live streamed tournament. Whilst I managed to build a big chip stack, it obviously wasn’t big enough to win the all expensive paid trip to one of the resort casinos where games are streamed from. Oh well, next year perhaps! 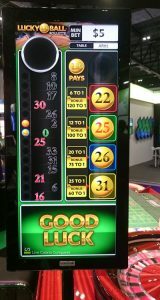 On display at the stand was a new Roulette side bet, “LuckyBall” that has been developed by Paltronics in Australia. Authentic hold the exclusive live casino rights to this side bet that will pay up to 100 x your stake. We should see this appear in late March. UK players will happy to hear that a UKGC licence is currently going through, so we’ll soon be able to play at these tables. On the back of this Authentic are also in discussion with a UK Land Based Casino to stream their roulette online. Other players can also expect to see 2 new casinos in Bucharest added to the playlist. Inter-resort streaming is also on the cards with discussions currently underway in the US with a large land-based casino/hotel in New Jersey / Atlantic City. Extreme Live Gaming fresh on the scene a few years ago is continuing to expand and develop their products. 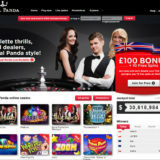 Recent enhancements have seen a new lobby interface rolled out and the addition of La Partage Roulette. Leaderboard functionality is now being added so operators can add their own tournament leader boards to the already existing network ones. This will give the operators more scope to offer their players on table promotions without the need for a dedicated table. New games are in development, but they were keeping the details of these close to their chests. If you ever saw my initial review of Extreme Live Gaming you’d know their studios are based in London. Well, they are expanding to another floor and also have plans to open a new studio in Romania. Licensing is always a constraint for operators and suppliers so it’s great to hear that new jurisdictions are going to be added during this year. We’ll also probably start to see some Asian based tables as Extreme start to collaborate with an Asian Live Casino provider. 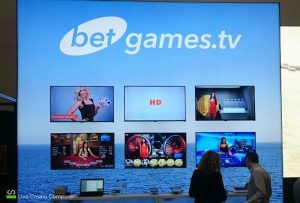 BetGames.TV have been around for a while but have not been on my radar due to no UK License. I first spoke to them last year. While their 9 games streamed from Lithuania are not what I play, I could see that a cross section of players would love the presentation style (and the very attractive women). This year I was told that they had finally obtained a UKGC License. I was intrigued as I hadn’t seen any operators pushing their games. No wonder, as I was told that they had no-one available to push the UK market. Go figure! Still, they are popular in CIS countries, Turkey, South Africa and Asian & Latin regions. 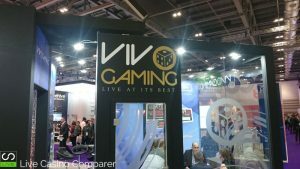 Vivo Gaming had a large stand and it seemed to be very busy. The promo girls in their body suits were certainly able to attract the punters over. A UKGC License is on the cards, but they’ve been saying that for the past few years. Licenses are expensive so it really needs an operator who wants the Vivo product and to target the UK before a license is applied for. Anyway, no new games are in development. The existing catalogue of Blackjack, Roulette, Baccarat, Dragon/Tiger, Sic Bo, Caribbean Poker and Craps is extensive but if a client wants a new game it can be built quite quickly. HTML5 for the desktop is being released in March and they are offering free lobby customisation too. They have a studio in Costa Rica and will be opening a new one in Eastern Europe shortly. 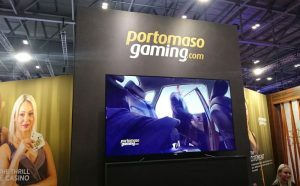 Based in Malta, Portomaso Gaming has been streaming Live Roulette from the land based Portomaso and Oracle Casinos for a few years. About 18 months ago they added a small studio in the Portomaso casino so they could stream Blackjack and Baccarat. At the show, they announced that they’ll be launching a new online casino specifically for the Oracle brand. They will also build a new studio in the Oracle Casino. They’re also launching a new Hi-Lo Side bet for Roulette. Jessica a dealer from the Portomaso (in the pic) was on the stand. I was surprised to learn that the dealers are used on both the studio and land based tables. 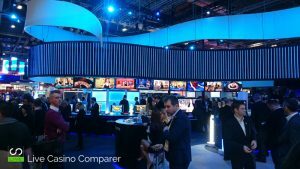 NetEnt had the usual large stand and live casino had a more prominent position than last year. 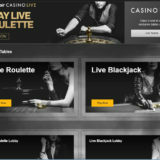 We can expect to see a new Common Live Blackjack product and Mobile Live Blackjack is set to be released in March. Operators (via an Opt-In) will also be able to take advantage of a new Live Rewards concept, where they can reward players with cash, bonuses or free rounds on NetEnt Slots while they play the table games. The stand also contained a Live Roulette wheel, two dealers (Luana and Antonella) and a camera. The dealers demonstrated how to spin the roulette wheel (not as easy as you’d think) and the whole thing was filmed. I was very impressed with how easy it was to select a skin (I chose Halloween) and how it looked on screen. You can read more of what happened when I was given a lesson in how to deal live roulette. XPG had a smaller stand than I’ve been used to. But it was nice to see Lana again and have a chat about their products. It’s a shame they don’t have a UK licence as I feel the games would do well here. They have recently introduced a Wheel of Fortune and Andar Bahar a game popular with players from India. Bingo Boom is a software provider I haven’t bumped into before. They had a pretty big stand and were very keen to talk to visitors, myself included. They’ve been around for 5 years and have over 700 Betting shops in Russia. 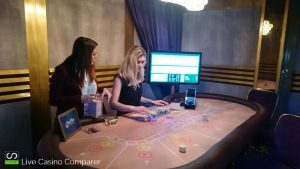 They have a live casino studio in Riga, Latvia with 4 tables and their games include a Money Wheel, Roulette, Bet on Live Poker, Bingo and Keno. They mainly target Russian, European and Chinese players and work closely with BetConstruct and MarathonBet who are one of their clients. 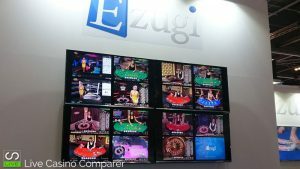 Ezugi is another Live Casino provider who is gaining market share across the globe. 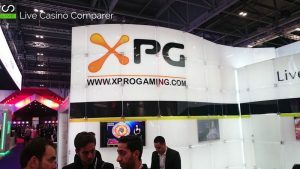 They have a complete solution for live games and studios that span the globe. This gives them the ability to reach most gaming markets. I interviewed CEO, Kfir Kugler and Business Development Director Sagi ifrache last month so have already published the latest news from Ezugi. Evolution Gaming didn’t disappoint. They had a two story stand and had two new games on display. The new Dream Catcher Lucky Wheel was the centrepiece. Almost tucked away was the new Dual Play Baccarat which is set to launch in a few months time. 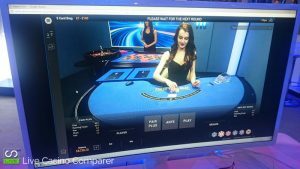 They had a Baccarat table and small studio rigged up on the stand and was streaming Baccarat Dual Play live to the conference. I got to have a sit-down and play a few rounds. It’s a multi-seat game and each position has a small camera embedded in the table cushion in front of each player. The player with the highest bet gets to squeeze the cards and they are the images that the online players will get to see. The game relies heavily on the player to squeeze in a way that the camera can pick up. I’ll be interested to see how this works out in a busy land based casino. By its very nature, the game will be slower than the online version. Evolution is currently in discussion with a number of land-based casinos to get this installed. There are clearly other things in the pipeline but Helen Hedgeland, Managing Director of Evolution UK wasn’t quite prepared to share them with me just yet. At ICE 2016 I found it difficult to talk to anyone about the Playtech live casino product and their road-map. But after the show, I was invited to Playtech’s offices and met with Kevin Kilminster, Head of Live Casino. We chatted and he discussed his vision and plans for the next 12 months. These included a new studio and a player/customer led strategy rather than a product one as it was then. I went away thinking this sounded great. But I’m a bit of a sceptic so I thought they would struggle to deliver everything we discussed. Well, fast forward 12 months and Kevin and his team have certainly delivered. I can’t believe that Playtech hasn’t made a bigger deal over their achievements because they are huge if you compare to where they were 12 months ago. Perhaps it’s because they haven’t completed the rollout and migration to the new studio quite yet. So in summary, Playtech have built a new state of the art Live Casino Studio in Riga. Over the next 3 – 4 months all tables and clients will be migrated to the new facilities. A new Intelligent lobby that remembers your playing preferences and a new playing interface will be fully rolled out. A new Live Game, 3 Card Brag (essentially the same as Evolution’s 3 card poker) will become available. Operators will have the ability to offer gaming experiences to their players. They’ll be able to present branded slots and Live casino games together. Thus providing a complete branded experience to the player. Everything has been developed in HTML5 so there is now a seamless transition from desktop to mobile. Outside of the innovations, a new Live Casino Academy has been developed where dealers will receive their training. The dealers have new uniforms & dresses. Gone are the microphones and also the legacy table names, which will be replaced with something more functional. All in all, a massive change that brings Playtech up to a level where they can truly compete with their peers and in some instances lead the way. A similar exercise is being planned for Playtech’s Asian based solutions. 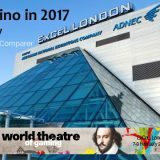 So there you have it, my comprehensive rundown of Live Casino in 2017, minus a few missing companies i.e. 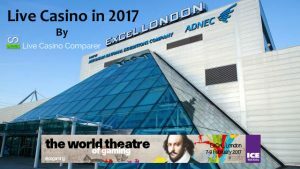 LuckyStreak (who are building out a new studio), MediaLive, Global Gaming Labs & Visionary iGaming to name the most recognisable. There’s much more focus on helping operators cross-sell Live Casino Products. We’ve seen the Lucky Wheel, Side Bets on Roulette and Player Experiences developed to attract slot based players who like the adrenaline rush of 1000x stake returns. More player-centric products, making it easier for players to play. There’s more streaming from land based casinos that now includes Baccarat tables. Niche providers are doing a great job against the established big solution providers. There is a greater choice for the player. Asian operators wanting to partner with European based providers. 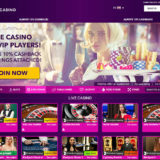 A general expansion of the Live Casino product. It’s bigger, better and more people now want it.